Leaders of Northumberland National Park Authority have described 2018 as a momentous year for the Authority and tourism in the county. In March, for the second time, Northumberland National Park won the prestigious accolade of National Park of The Year in the BBC Countryfile Magazine Awards 2018. Almost 180,000 votes were cast by nearly 30,000 people, representing the biggest response in the award’s history and resulting in Northumberland National Park winning the strongest and most debated category. This has been followed by Northumberland recently battling it out in a public vote against nine other regions to be crowned the Best UK Holiday Destination at the 2018 British Travel Awards. Northumberland’s gold award brought an end to Cornwall’s four year reign in the hotly contested category. The event is the largest travel-awards programme in the UK with travel and tourism organisations viewing it as the highest of all travel accolades because it’s the visitor that determines the winner. In August, Northumberland National Park Authority’s flagship Sill: National Landscape Discovery Centre on Hadrian’s Wall, welcomed over 172,000 visitors at the end of its first year of operation, well ahead of its expected visit or levels. 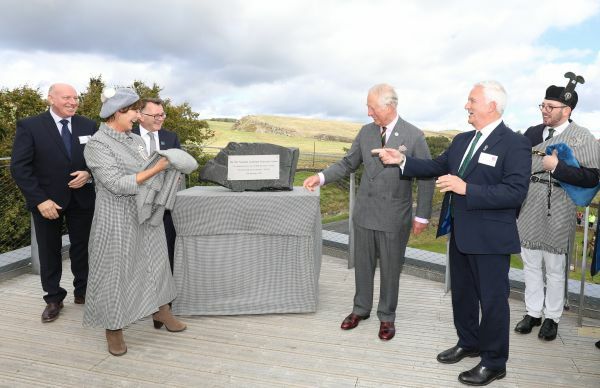 During September the Park also made national and international headlines when HRH the Prince of Wales carried out the official opening of The Sill. Glen Sanderson, Chair of Northumberland National Park Authority, said: “This has been a tremendous year for the Park and the county as a whole. Northumberland winning gold in the Best Destination category at this year’s British Travel Awards really cements everything that is wonderful in the county and our National Park. Tony Gates, Chief Executive at Northumberland National Park Authority and a Director of Northumberland Tourism Limited, said: “There’s no doubt 2018 has been a momentous year. Northumberland National Park offers some of the very best outdoor recreational experiences in the UK and currently attracts more than 1.5 million visitors a year to the area. “In December we celebrate the 5 year anniversary of our International Dark Sky Park – still the largest ‘gold tier’ Dark Sky Park in Europe. Our Dark Skies have brought a welcome boost to tourism in the quieter months and a new set of first-time visitors to the county. Glen Sanderson adds: “Northumberland is a beautiful and rightly ambitious county. We look forward to welcoming more visitors to have exceptional experiences in the National Park in 2019. “For example, the Hadrian’s Wall Path National Trail and the Sandstone Way Cycle Trail are two of Northumberland’s most popular routes which are managed and coordinated by the National Park Authority and our partners.